If you haven’t heard of the Kumon method, now’s the time to prick up your ears. 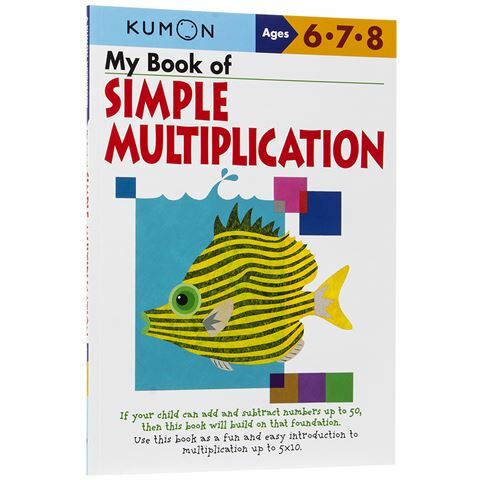 The Kumon method, based on a logical, simple step-by-step approach, started in Japan in 1958, to help children and teenagers supplement their learning. Since then, the philosophy has grown, and the Kumon ‘My First’ books have become a trusted way for children to build their reasoning skills, pencil skills, and numeracy. My Book of Simple Multiplication has been created with children aged six, seven and eight in mind, in order to help them with basic math skills in a step-by-step manner. This book gradually grows more difficult as your child progresses – but never too difficult! Consider this book a way to help your child build on multiplication foundations. If your child can add and subtract numbers up to 50, with this book, they’ll also learn multiplication up to 5 x 10 without frustration and tantrums. It’s simple, easy to follow, and encourages solo learning. For educational fun that never compromises on quality, look no further than Kumon. Suitable for children aged 4, 5 and 6, or from when they can add and subtract numbers up to 50. Children will learn multiplication up to 5 x 10. Written for children to become self-motivated learners. Focuses on one concept of writing at a time, so children grasp them completely.